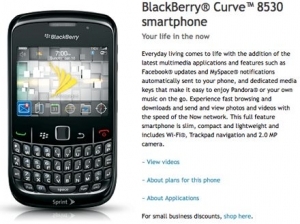 BlackBerry Curve 8540 now on Sprint | BlackBerry Blast! Sprint is now offering the WiFi enabled BlackBerry Curve 8530. The 8530 features a 2 megapixel camera, 2.5-inch display, BlackBerry OS 5.0, a 3.5mm headphone jack, and WiFi. If you sign the usual two-year agreement and wait for a mail-in rebate you can pick up a BlackBerry Curve 8530 for $49. Not bad for a solid smartphone from RIM.